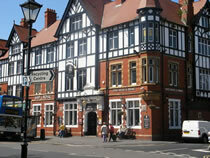 The Ship & Royal was once a hotel and is now a public house. In 1978 the Blackpool Gazette featured a story of a ghost nicknamed “Charlie” but implies that the ghost is that of a local who liked to spend time at the inn called “John Talbot Clifton” who died in Tenerife 1928. This spectre has been know to show himself on the second floor and has been blamed for moving paper work and placing orders for the business by telephone! It is also believed that the spirit of a Mother and Daughter who both committed suicide by drowning themselves in one of the bathrooms at the beginning of the twentieth century. The upper floors of the building has twenty or so rooms which are closed to the public and despite no plumbing to these rooms running tap water is often heard.